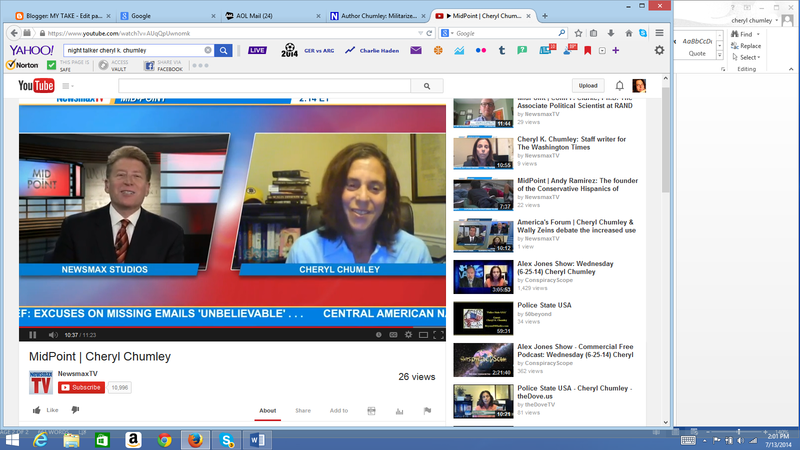 Stay tuned for more clips ... Rick Amato's One America News, Greta Van Susteren's Fox News, CBN and others. May 2015 interview with Jennifer Wishon, the White House correspondent for CBN, about President Obama's recent move to restrict military equipment for civilian police forces. Tammy Bruce was kind enough make our podcast chat public ... listen here for free! This is Tammy's lead-in: "I had the pleasure of speaking with Washington Times reporter Cheryl Chumley back in June about her new book, “Police State.” It was the Ferguson situation which alerted most Americans to the problem of outfitting local police departments with military equipment, but Cheryl was on it well before and we discuss the details of this problematic development." My speech at the Sacred Fire of Liberty Gala in Maryland in September, 2014, on media bias ... including some of my personal experiences with media bias, linked here. Feel free to email me your thoughts at ckchumley@aol.com. Newsmax TV's J.D. Hayworth, host of America's Forum, ringing in the 2014 Fourth of July with a quick discussion about the Founding Fathers. John Stossel and I discussing Police State USA in the aftermath of Ferguson, Missouri. He's a great host -- very soft-spoken and non-confrontational. My interview with Alex Jones in the aftermath of Ferguson, Missouri, about police militarization and about my book, "Police State USA." Alex on my book:"You know, I know a lot about the police state, and folks out there might think that I couldn't learn something or you couldn't learn something from a book ... we sell the book, it's excellent, it's full of documentation." Kerby Anderson with Point of View discussed Police State USA, the growing surveillance situation and the state of the nation through a biblical perspective in an hour-long interview with me, beginning around the 1:01 mark (second hour of the show). Discussing the Washington Redskins and the First Amendment breach over the trademark registration fiasco. http://rt.com/shows/breaking-set-summary/169536-usa-police-nsa-obama/ ... around 23 minute mark. Interview with Scott Greer for: "Is America Starting to Target Thought Crime?" Interview with Matt Kittle for: "With Liberty in Peril from Within, Would Founders Recognize the USA?" ... and more ... in process of updating. Stay tuned!